Type 2 Diabetes - How to reverse it and have permanent fat loss. Type 2 diabetes can be reversed when you know what to do. Twenty-five percent of the American population now has this disorder and a whopping 1 in 3 people born since 2000 will develop it. Yet, it's a condition that health officials and medical practitioners agree is for the most part preventable and still it has reached epidemic proportions. Type 2 diabetes is a complex disorder characterized by having high blood sugar. This means we have become caught up in modern lifestyles that encourage far less exercise than previous generations AND a food supply that consists of cheap, affordable foods filled with lots of hidden sugars. It can be a very challenging disorder because it causes high blood sugar which can make you feel like you aren't getting enough food. The problem is eating too much high glycemic food. High blood sugar can cause fierce sugar cravings. Your body is not effectively using the glucose in the carbohydrates you are eating. Many of the high glycemic foods that cause high blood sugar are hidden as additives in processed foods. You probably aren't even aware of all the hidden sugars you are getting in your diet. Your body can mask the threat of high blood sugar because as your blood sugar goes up, the pancreas makes more insulin, the hormone that regulates it. The high blood sugar may not show up yet on a test. You need to have your insulin levels tested too. There is also confusion about diabetes because there are two types. Type 1 diabetes is an auto immune disease caused by the body destroying the beta cells in the pancreas that make the hormone insulin that regulates blood sugar. People with type 1 diabetes produce little to no insulin and in fact are dependent on insulin injections. Scientists believe there may be a genetic predisposition that allowed for some environmental insult, perhaps a viral infection in childhood or early adulthood, that causes the immune system to break down. Only 5 to 10% of the population is diagnosed with type 1 diabetes and it is rarely diagnosed in adults. It requires careful supervision by a doctor and monitoring by you because you are supplying the insulin. Type 2 diabetes is very different from type 1 diabetes because your body does indeed make insulin but your body's ability to use it effectively has become impaired. Insulin is supposed to regulate blood sugar but chronically high blood sugar causes your body to release too much insulin. The insulin that is supposed to bind to a cell receptor can no longer to do that. Your cells "resist" the insulin. To make it even more complicated, when you are fat there is an increased need for insulin and the pancreas cannot keep up with the demand. This causes the sugar cravings; your body is looking for energy. While both types mean that you have poor blood sugar control and insulin impairment, the reasons are very different and the resulting insulin impairment is different. You will have type 1 all your life and it will require extreme care and management. Type 2 is within your control. You need to adopt serious lifestyle changes but it can be stopped. So, this is the good news. You can reverse type 2 diabetes. However, be sure to see a doctor if you think you might have type 2 diabetes, especially if you are obese or experiencing any health complications. Why being fat is the biggest symptom. Insulin resistance appears in fat or obese people 80 - 90% of the time. This is because high blood sugar and high insulin also lead to fat storage. When there is too much glucose in the blood the insulin tells the body to store it as fat. 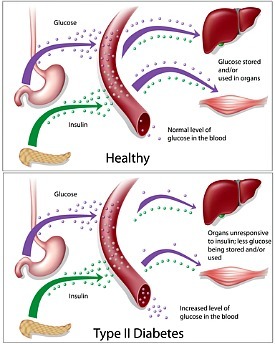 High blood sugar causes high insulin causes fat storage and obesity. When the body makes too much insulin, it stimulates LPL (the fat storing enzyme) and blocks the conversion of fat to energy. Fat is stored particularly around the abdomen, the belly fat. The delicate process of transporting glucose to the muscle cells for energy and the fat metabolism mechanisms are disrupted when too many high glycemic, insulin-stimulating carbohydrates are eaten consistently over a long period of time. When high blood sugar becomes chronic, type 2 diabetes or insulin resistance can develop. The rates of obesity and type 2 diabetes have been skyrocketing in recent years. You can look at the causes of obesity and understand what's going on here. If hidden sugars and more sedentary lifestyles have contributed to the degree to which we have become a nation of fat people, then it follows that type 2 diabetes reflects that. High insulin means you are storing fat. It also means that you are craving the very foods that are causing the problems and some of those foods are hidden sugars in processed foods. Type 2 used to be called adult onset diabetes but that term may be becoming obsolete. So many children are being diagnosed these days with type 2 diabetes that the term may no longer apply. There may be a genetic predisposition in families so adults who are overweight or obese will have children who are at risk. However, with an understanding about the dangers of hidden sugars and processed foods and making a determined effort to get the whole family exercising regularly, type 2 diabetes can be reversed. Here's what can happen if you DON'T manage your blood sugar. You are at risk for heart disease, cancer, hypertension, high blood pressure, premature aging of the skin, depression, Alzheimer's and Parkinson's disease. This is what an overload of blood sugar and insulin leads to over time. But you CAN do a lot to prevent this. All health professionals agree that high blood sugar is the problem and diet and exercise are powerful tools in lowering blood sugar. The problems are a processed food industry that markets cheap food and sedentary lifestyles. Insulin resistance can be prevented and reversed. Even if diabetes runs in your family and you have family members who are obese, do not despair. You CAN stop this condition. Food and exercise are your best medicine! When it comes to reversing type 2 diabetes, the best diet is simply low glycemic eating and regular exercise. In 2008 a study published in the New England Journal of Medicine found that the Mediterranean diet rich in omega 3 fatty acids and low glycemic carbohydrates is the best diet to control blood sugar. This is the way to increase your insulin sensitivity. This is a food lover’s diet but acts like medicine in that it nourishes your body, increases your insulin sensitivity and supports you in maintaining a lifetime of fat loss. Foods that raise your blood sugar need to be eliminated. Learn to read food labels and avoid the hidden sugars. This is a healthy way to eat for everyone but especially for those at risk for diabetes, which means everyone who is fat. Once you start eating low glycemic foods your cravings WILL go away and it doesn't take that long. Low glycemic eating is the focus of the Lifetime Fat Loss way to ideal weight and improved overall health. Your first step is to get rid of and avoid the white, refined carbohydrates that are high glycemic. Start walking daily; take up some type of vigorous exercise, dancing, swimming, going to the gym or bicycling. Get moving because exercise increases insulin sensitivity. Sign up for my newsletter and go to the 10 Success Steps for the low glycemic plan. According to a study published in the Journal of the American Medical Association, type 2 diabetes can reduce your lifespan significantly. It's time to make some serious changes in your lifestyle. This website was designed to help you do that. Scroll down for many more articles about the diseases of high blood sugar and what you can do about it. Keep track of your blood sugar easily. Yes, cinnamon can assist you in managing your weight by supporting low blood sugar and the regulation of fat metabolism! Return from Stopping Type 2 Diabetes to Lifetime Fat Loss home page.